Less than 10 percent of commercial customers of Rumpke Waste & Recycling in Oxford recycle any of their trash. Among 549 Oxford commercial customers in Rumpke’s system, only 50 participate in recycling, according to information provided by the company. 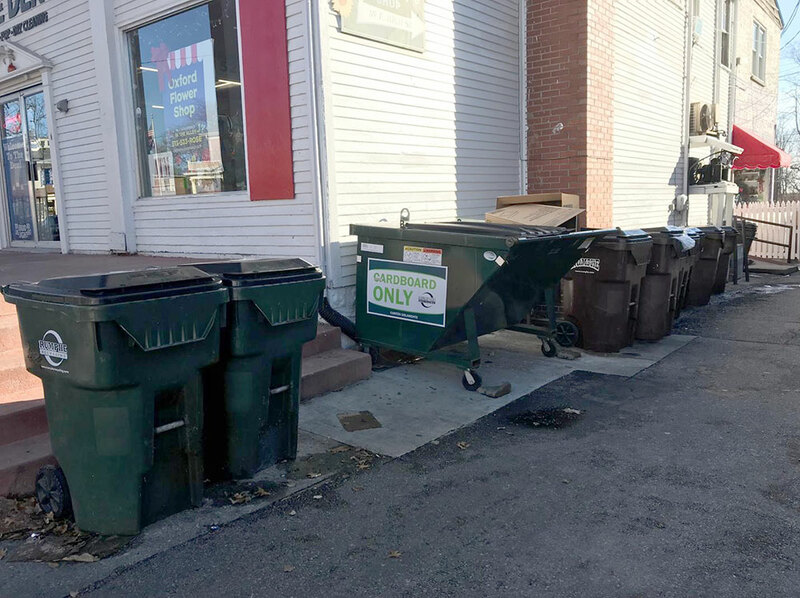 Both residents and businesses can recycle, but only businesses pay an additional cost for the service, said Rumpke spokesperson Molly Yeager. That additional cost is only one of the reasons Oxford businesses will not recycle, and many will not even discuss their recycling policies. For franchise restaurants, nationwide company rules pertaining to waste cannot be changed by local outlets. Former and current employees at Buffalo Wild Wings in Oxford, for example, confirmed that they do not recycle their products; all bottles and paper products go directly into the trash, in spite of company rules. Members of management at the local store said that they could not discuss company procedures with the media. 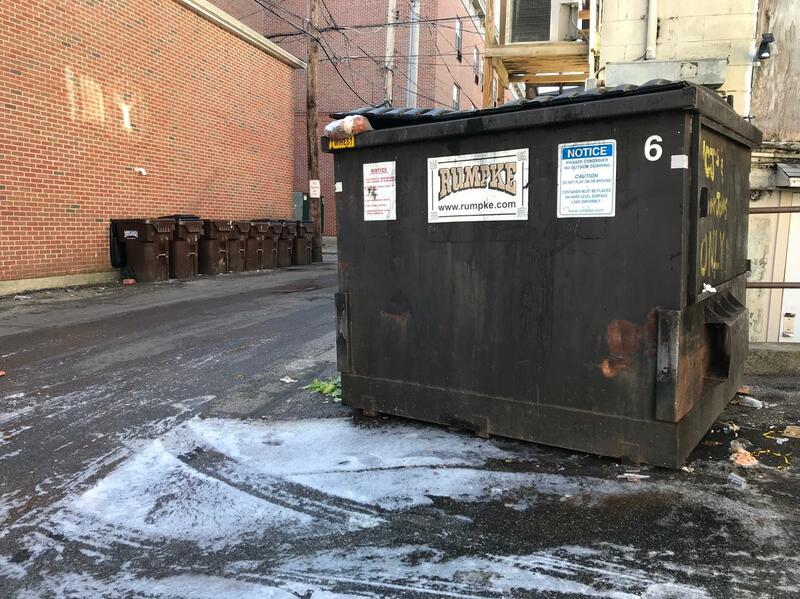 Similarly, a Chipotle manager at the uptown Oxford location said that to talk about recycling, one must contact the national headquarters of the company. La Bodega used to recycle, but circumstances have steered them away from the practice. Faundez said that La Bodega gave up on recycling about two years ago. Amarantos has been in the area for about 35 years and said that Skipper’s has been recycling for about the same amount of time. And anyone who tries to contaminate his recycling practice? Well, they’ll have to go through him. While the cost of recycling may deter businesses from getting recycling bins, schools and businesses in Butler County are encouraged to apply for grants to curb these costs. There were two major decreases in Butler County Recycling revenue in 2013 and 2014, said Anne Fiehrer Flaig, executive director of Butler County Recycling and Solid Waste. In Ohio, county recycling grant money is derived from the waste produced in the area, paid by the landfill to the county. With cutbacks in recent years, Flaig said the rate has been reduced from $2 per ton generation fee to $1 per ton. But what does this “generation fee” really mean? Basically, it means that the more garbage that is dumped in landfills, the more money the county will get for recycling. As Flaig put it, “It’s cheap to be wasteful in Ohio. The total amount of grants distributed by Butler County Recycling fluctuated from $26,700 in 2008 to $12,600 in 2016. In 2011 and 2014, nearly $70,000 in grants were awarded to supply recycling containers for Hamilton City Schools, and, in 2014, to add recycling services to various Oxford apartments, including Elmwood Apartments, Hawks Landing, Fox & Hound Apartments and Oxford Commons, among others. “In 2014 Butler County Recycling embarked on a major outreach initiative in Oxford to enlist more apartment communities to establish recycling programs, and to enlist restaurants and bars to recycle,” Flaig said in an email. Over $20,500 of the $67,000 in grant money given out in 2014 was for recycling service fees at apartment complexes and businesses. It has been four years since this initiative, and yet many of the Uptown businesses in Oxford remain trash-only. A large proportion of the yearly awarded grants go towards school initiatives. Flaig said that there is a “kind of rotating focus” on the different districts and schools throughout Butler County, so as to equally spread resources. A study conducted in 2011 showed that Talawanda High School recycled an estimated 27 tons annually, according to the Butler County Recycling and Solid Waste District. Nearby, Badin High School recycled an estimated annual 200 tons and Fairfield City Schools an estimated 660 tons. Talawanda did not have a systematic recycling system in place until around 2008, said Talawanda High School director of communications and public engagement Holli Morrish. In 2007, two Miami grad students partnered with the high school to come up with a recycling plan. Between 2008 and 2009, Butler County Recycling provided the high school with a total of over $2,500 in grants, according to information provided by Butler County Recycling and Solid Waste District. With that money, the school was able to buy proper recycling containers. Morrish said that the school has seen significant progress in recycling since then, and even growth within the past year. This year the school requires three pickups a week of recycling, compared to last year when they had just two pickups per week. Despite this progress, Morrish said that she has to continually defend the recycling program to people who claim they have seen trash and recycling going in the same dumpsters behind the school.